A rendering of what the renovated Central Park area will look like: the former Strip restaurant will be demolished in February and two new stand-alone eateries will be built. Speaking in Hines’ offices, which Gariza calls the least attractive location in Atlantic Station (taking the worst spaces for yourself is Commercial Real Estate Strategy 101), his claim sounded less like hyperbole once he laid out the details. 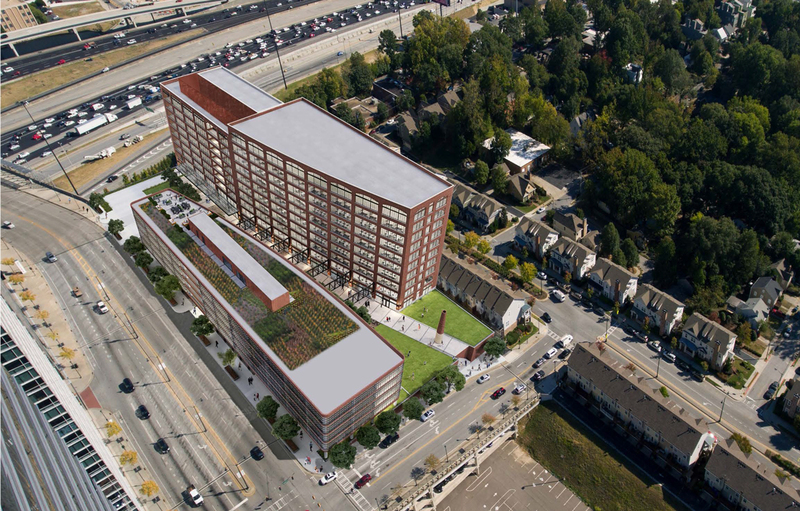 Beginning in February, a wave of large projects will aim, collectively, to make Atlantic Station feel like less like an island and more a neighborhood of eclectic architecture woven into Midtown. It’s ambitious, but Hines is confident they have the momentum—and money—to start pulling it off. 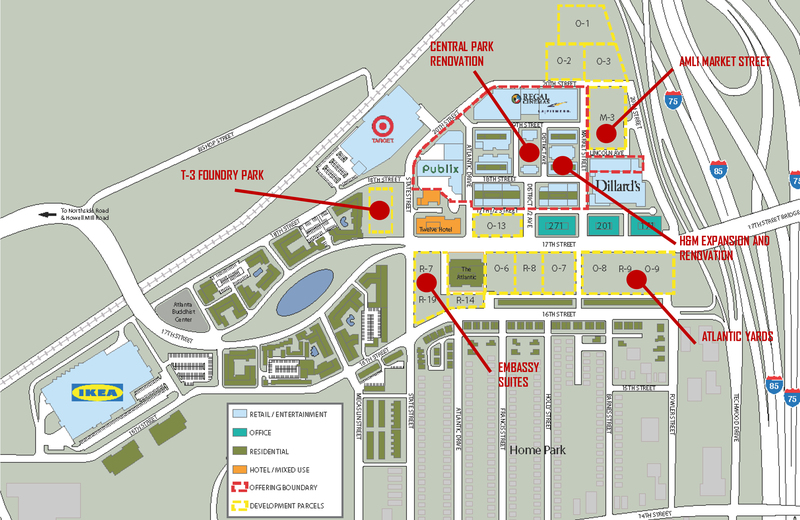 With its own zip code and 2.5 million square feet of offices, homes, restaurants, and behemoth retail anchors such as IKEA and Dillard’s, Atlantic Station might seem massive now, but it’s less than half built, with several huge holes remaining. Projects scheduled to break ground in 2018 are planned to add thousands of workers, hundreds of new residences and hotel rooms, and fundamental changes to how certain facets feel (although the ubiquitous, piped-in music will remain). Garzia walked us through several key projects that are fully financed and ready to move forward this year. 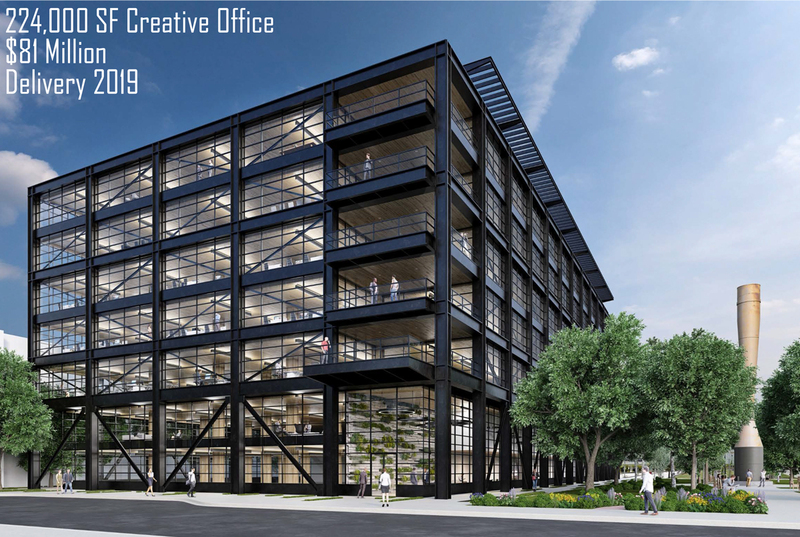 Scheduled to break ground in February, this $81-million stack of “creative offices” by Hines—built of sustainable timber beams to lend that vintage, cool vibe millennial workers covet—will consume a parking lot between the Millennium Gate and Target. The company built similar T3 (the name refers to buzzwords “timber,” “transit,” and “tech”) concepts in Minneapolis and Chicago, geared toward younger, tech-savvy employees who prefer to commute by foot or bike. 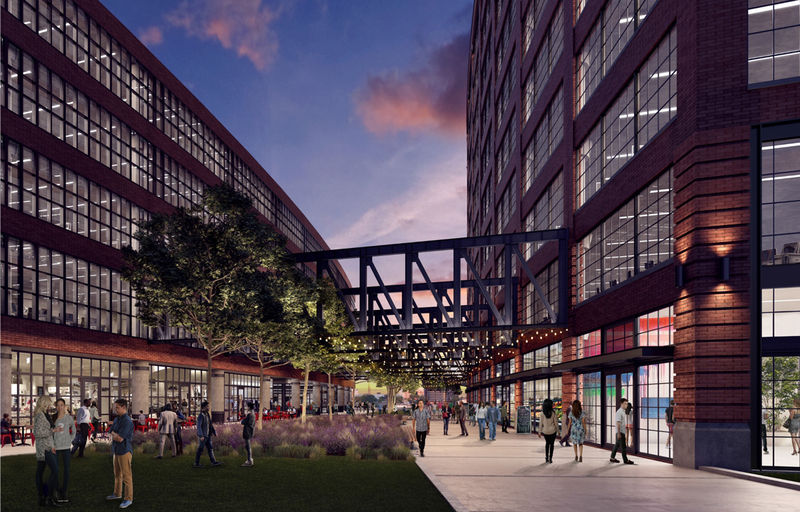 Expect bike-storage facilities, rooftop terraces, and a fitness center. 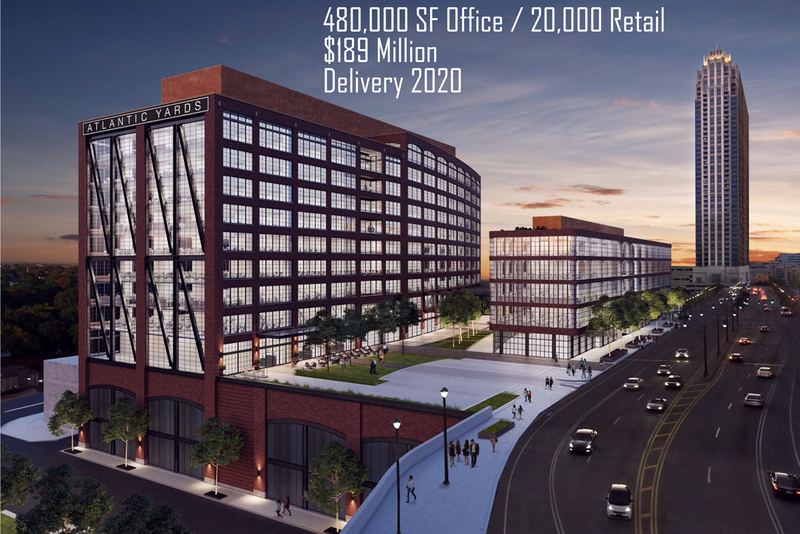 Between the two office ventures, Hines predicts about 2,000 more workers will join Atlantic Station’s current daily pool of 4,000. 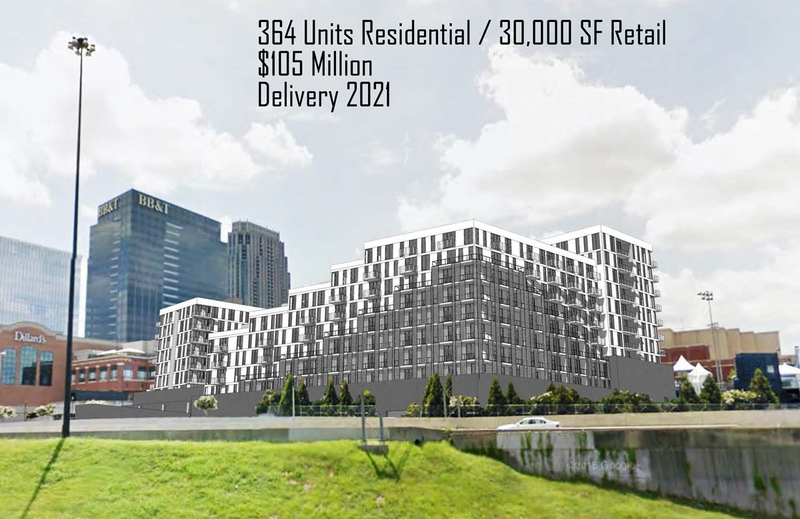 Along with Atlantic Yards, the most visible sign that Atlantic Station is beefing up—especially for the half-million Connector drivers who pass it each weekday—will be a contemporary-style stack of 364 apartments by national developer AMLI. Aiming to break ground in June or July, the project will rise where the BB&T Atlanta Open tennis tournament has been played for several years (Hines is in talks to host the tourney elsewhere on site, possibly beginning this year). It’ll include about 25,000 square feet of shops at street level (on the side opposite the Connector) and plug a highly visible gap. Expect monthly rents of about $2.20 to $2.50 per square foot at what Garzia describes as a “whole new front porch” for the mini-city. The ever popular Regal Atlantic Station will also get an upgrade. An interior remodel beginning this spring at the theater, which already counts an IMAX theater among its 18 screens, will result in a total of six deluxe VIP auditoriums (think: full-service lounge and big recliners). And one of them will be Georgia’s first immersive 4DX experience, a technology “that’s very Disney-esque,” says Garzia. “If you’re sitting there watching a movie and the car crashes, your seat will shake. Or you’re walking through a garden, they will pump in the smells you would smell; if you’re in a slasher moving in London, the fog will roll into the auditorium as well. It’s highly, highly experiential.” Atlantic Station will be just the seventh Regal theater to offer 4DX (the others are in Los Angeles, Orlando, New York City, Seattle, and Washington DC). Expect adult ticket prices north of $20. 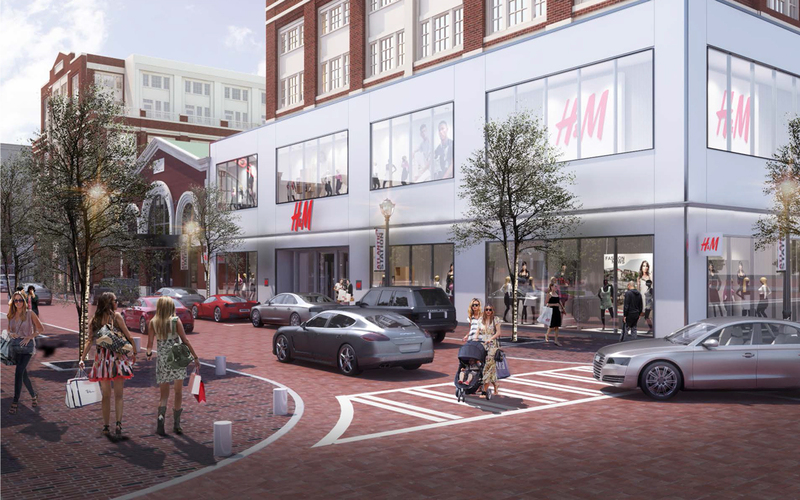 Another all-star tenant—Swedish clothing company H&M, whose Atlantic Station outpost is the highest performing in the Southeast—is expanding from 26,000 to nearly 40,000 square feet and adding a more modernized exterior. “It’s going to have a flagship look just like what you’d find on Michigan Avenue in Chicago or Fifth Avenue in New York,” said Garzia. 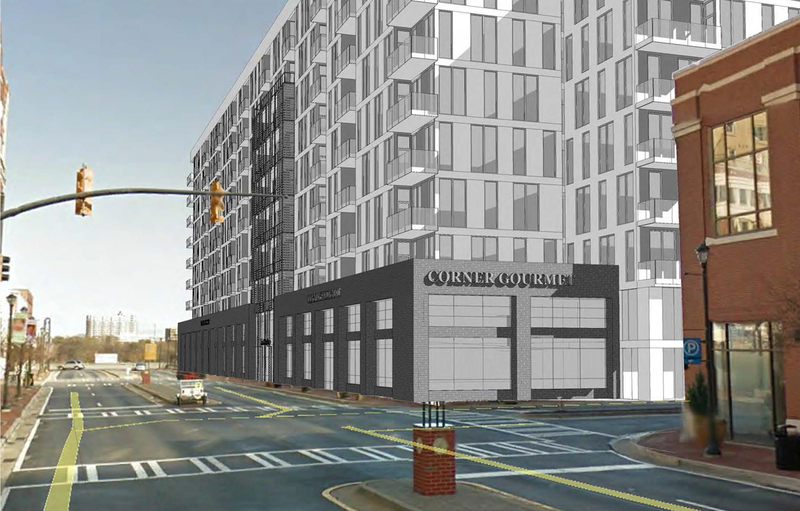 On land that shares a property line to the west of the Atlantic condos (Atlantic Station’s tallest building), Horizon Hospitality plans to break ground this year on a 157-room Embassy Suites hotel with some retail space at ground level, Garzia said. The site, for now, is a grassy lot at the corner of 17th and State streets. 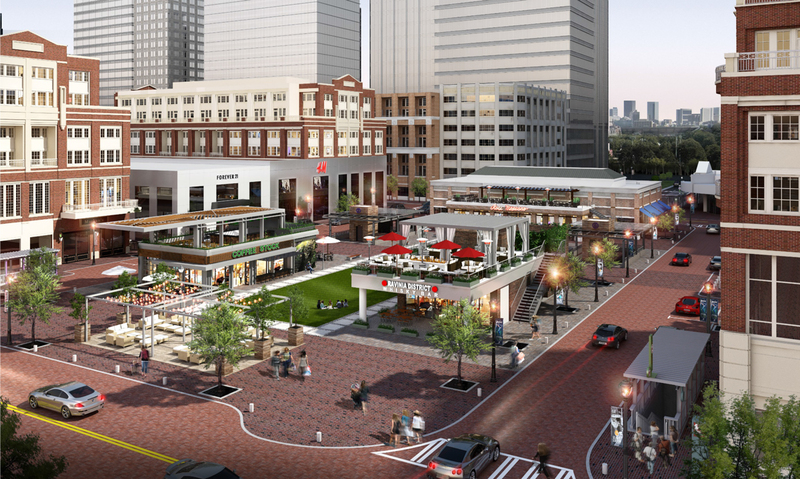 On a smaller scale, a few notable changes are forthcoming on Atlantic Station’s dining and retail fronts—with other deals in the works that have yet to be inked. In the former Copeland’s Cheesecake Bistro space that fronts the expanding park, Japanese barbecue concept Gyu-Kaku should open by April. And in the nearby slot most recently occupied by Tim Drum Asian Kitchen, local fast-casual Indian chain NaanStop should be doing business by early May, Garzia said. Meanwhile, Bath and Body Works is undergoing a remodel, and Victoria’s Secret’s longstanding Atlantic Station store is expanding and adding their Pink product line, which is aimed at younger women and teens. 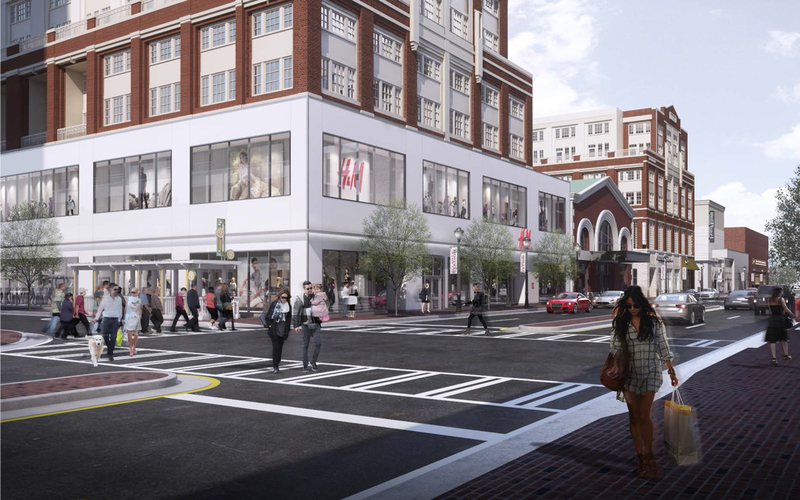 Atlantic Station’s Twelve hotel is also undergoing an $8-million renovation.